Patek Philippe & Cie, Genève, No. 1119103, case No. 320327, Ref. 3448, made for the Italian market. Production of this reference started in 1962. Exceptional and extremely rare, self-winding, 18K yellow gold gentleman's wristwatch with perpetual calendar without moon indication, and an 18K gold Patek Philippe deployant clasp. C. three-body, solid, polished and brushed, inclined bezel, triangular lugs. D. matte silver with applied gold bâton indexes, graduation for the days of the month, apertures for the days of the week, and the months. "Dauphine" yellow gold hands. M. Cal. 27-460 Q, stamped with the Geneva Quality Hallmark, rhodium-plated, "fausses côtes" decoration, 37 jewels, straight line lever escapement, Gyromax balance adjusted to heat, cold, isochronism and 5 positions, shock-absorber, self-compensting Breget balance spring, 18K gold rotor.Dial, case and movement signed.Diam. 37 mm. C. three-body, solid, polished and brushed, inclined bezel, triangular lugs. D. matte silver with applied gold bâton indexes, graduation for the days of the month, apertures for the days of the week, and the months. "Dauphine" yellow gold hands. M. Cal. 27-460 Q, stamped with the Geneva Quality Hallmark, rhodium-plated, "fausses côtes" decoration, 37 jewels, straight line lever escapement, Gyromax balance adjusted to heat, cold, isochronism and 5 positions, shock-absorber, self-compensting Breget balance spring, 18K gold rotor.Dial, case and movement signed.Diam. 37 mm. Ref. 3448 Produced in 586 examples from 1962 to 1982, with the caliber 27-460 Q, the majority in yellow gold, rarely in pink or white gold. This series began with the serial number 1119000. The present wristwatch was sold to an important client of Patek Philippe who in fact wanted a watch without moon phases. He therefore asked the manufacture to make a special dial concealing this function. Patek Philippe executed the order, leaving the lunar mechanism inside. This watch is one of only three known today: one, in yellow gold, was sold by Antiquorum, ovember 19, 200, lot 276; another, in white gold, is in private hands; the third is the present watch. 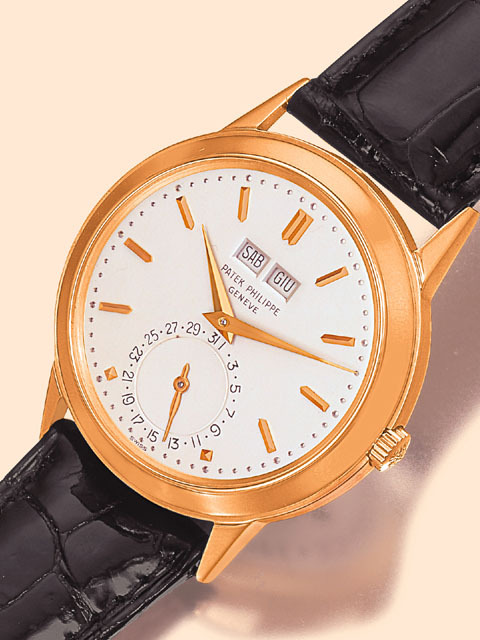 Another similar wristwatch with this reference is illustrated on page 289 of the 1998 edition of the Patek Philippe book and is mentioned as having been modified by taking out the moon phases and adding a dial, concentric to the days of the month graduation, for the leap year indication.